it's now official. Cherrapunji, which holds the record for the highest rainfall in the world, faces water shortage. In a written reply to the Rajya Sabha, the minister of state for agriculture Satyanarayana Rao said the water supply in Cherrapunji was 'inadequate'. If water scarcity is an indicator of drought, then Cherrapunji is also drought-hit. There is a lesson in this for those who have mismanaged the country's water resources. Desperate for solutions to the drought situation, now they have suddenly discovered the wisdom behind traditional water harvesting systems and have set themselves tight deadlines to revive this dying tradition. That the monsoons had failed was known as far back as the end of the 1999 monsoons. Yet, with the government unawares, Gujarat and Rajasthan inched closer to burning point. Finally in April, the media discovered drought and the 'calamity' made headlines. Most importantly, it made the government sit up and take notice. Initially, of course, there was the usual round of mud-slinging. The Gujarat government blamed environmentalists. If only, they said, Sardar Sarovar Dam would have been constructed, Gujarat would have had water. Union water resources minister C P Thakur vehemently supported this view. This was followed by political parties levelling allegations against each other and culminated in the all-party meet convened by Prime Minister Atal Behari Vajpayee on April 25. Finally, political parties decided to bury their differences 'for two months' and work unitedly to provide drought relief. "We cannot leave our brothers and sisters at the mercy of their fate or the cruelty of nature. At this moment, they need our help to tide over the calamity that has fallen over them, to survive hunger and disease, to rebuild their lives and save their cattle," said an emotional Vajpayee. 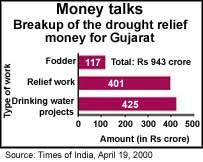 By then, the drought relief money had also assumed impressive proportions (see graph: Money talks ). Media on the roll Around this time, tragic stories accompanied by shocking photographs of the drought scenario began flooding newspapers and the television ( tv ) channels. Amid all the chaos, somehow some news made sense. Gradually, reports started filtering in that water mismanagement had led to the crisis and how in places, where communities had organised themselves into undertaking water management and harvesting, there was respite in the form of water in the wells, fodder for livestock and reduced migration. A visit by a researcher from the Centre for Science and Environment ( cse ) to areas where water harvesting programmes were being implemented proved the point (see box: Contrasting images ). For a long time cse had been promoting the concept of community-based water management to dispel the myth that drought is due to paucity of rain. After the trickle came a wave and all of a sudden every newspaper and tv channel was carrying stories on how community-based water harvesting helps in alleviating water crisis. Overnight, water mismanagement and water harvesting became the hot topic of discussion, replacing even the nasdaq and cricket. The new mantra Consistent reports drove the message home: not water scarcity but water mismanagement is the primary cause of the present drought situation. Now, the government has got downto the task of rediscovering waterharvesting. Union minister for urban development Jagmohan recently announced that water harvesting would be implemented on a large-scale to prevent water shortage, indicating that water harvesting may be incorporated in the building bylaws. But he went on to make a stunning revelation: he conferred the entire credit for finalising this "new technology which will successfully tap rainwater" on the Indian Institute of Technology ( iit ). This, one has to obviously take with a pinch of salt. After all there is historical evidence that humans have in the past devised remarkable water harvesting structures to store water. The present scenario is that organisations and governments are in a race to outdo each other in promoting water harvesting, both in urban and rural areas. A host of meetings on the subject is being organised in the national capital. Even mayors have been taking lessons in water harvesting -- it was on the agenda of a two-day national conference of mayors held in Delhi. A Cabinet note on water harvesting has been hurriedly prepared by the water resources ministry for groundwater recharging. The ministry wants rainwater harvesting to be implemented before the onset of this monsoon itself so that droughts can be avoided next summer! On the monetary front, the government is planning to set aside Rs 550 crore to undertake water harvesting in the drought-affected villages. This is expected to finance 10,000 water harvesting structures in regions identified as deficient in water. Under this scheme, the ministry will directly fund various village beneficiary groups and water users' associations that want to set up water harvesting systems in their areas through regional offices of the Central Groundwater Board ( cgwb ). Members include representatives of the state agricultural department and rural and urban water supply organisations. The plan is awaiting clearance by the Cabinet. This, scoffs Rajendra Singh of the Tarun Bharat Sangh, is letting "some more money go down the drain." Singh is convinced that unless people are made aware that they should play a more active role in water management and unless institutional frameworks are developed for their participation, none of what the government is planning will work. In Rajasthan, the government has already spent Rs 1,800 crore, and there is nothing to show by way of achievement. It only goes to show that there is more to water harvesting than simply building structures. "What is important is to build structures within communities and society," feels Singh. In Delhi, the irrigation and flood control department, the Delhi Jal Board and the Delhi Development Authority plan to undertake various techniques to tap rainwater, including rooftop harvesting and channel storage of rainwater. A steering committee comprising scientists, and experts from the ministry of water resources, agriculture, environment and forests, cgwb and the National Remote Sensing Agency has also been set up to study the recharge of drinking water sources. According to Sunder Lal Patwa, rural development minister, this committee will aim at gradually replacing the government-oriented centralised water supplysystem with a people-oriented, decentralised and demand driven programme. Under this, 20 per cent of the annual budget for drinking water supply programme will be given to those states which undertake community-based rural water supply programmes so that villagers play a decision-making role in the design and management of a project. That rainwater has caught the fancy of politicians and bureaucrats alike is good news. For, as the cse director Anil Agarwal says, "If rain is not caught and stored, it will be impossible to live in India." What remains to be seen is the strategy the 'water managers' adopt to harvest water. First the British did it. Subsequently the bureaucracy perfected it: destroyed people's initiatives in innovatively managing water (see box: What relief can do ). Indira Khurana, head of the cse unit working on promoting community management of water, said, "It is good that community-based water management has caught the attention of the media. But the moment the politician speaks about it we are afraid that the concept will be distorted forever."